Malta has some incredible beaches for such a small island, ranging from sandy paradises to rocky outcrops that are great for snorkelling and diving into the sea. In this blog post, we’ll tell you how to get to 10 of the best beaches in Malta! If your idea of relaxation is lying on a sunbed sipping an ice-cold beer or a cocktail under an umbrella surrounded by cliffs on a sandy beach, these two are for you! These two Maltese beaches are literally within walking distance of each other. Golden Bay has its own GoTo reserved pickup/drop-off points. It’s as simple as following the northern route to Cirkewwa Ferry Terminal on the Coast Road. Once you get past the St Paul’s Bay Bypass, you head straight off the roundabout. It’s more or less a straight route, well as straight a route as can be in Malta! Check the location here. Direction to this one is pretty much the same as given the above, but you will turn off just before you hit the farming village of Mgarr. A firm favourite with Maltese families, but it can get a bit crowded. This is another popular sandy beach, known for its calm waters and shallow walk into the sea. Same as before, follow the northern route to Cirkewwa and you’ll be led straight to it! Two more sandy gems that are on the same route. When you get past Mellieha Bay, you continue up the hill and when you see the Red Tower, take a right at the roundabout and follow the signs to either of these two beaches. Bonus: If you continue past the turnoffs to the beaches themselves, you can get to Slugs Bay. It’s a steep climb but totally worth it! At this point you might be wondering how many beaches lie on the North of Malta. Well, there’s a few left yet, including this little gem. Keep following the signs to Cirkewwa and just before you get there, there’s a turnoff to the left. Welcome to Paradise Bay. A word of warning though, the currents can be quite strong here, so watch out when you swim. Fancy visiting a movie set and having a swim while you are at it? Then look no further than Anchor Bay, home to Malta’s famous Popeye’s Village. 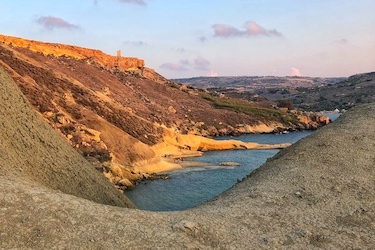 When you come to Mellieha Bay from the Bypass side, you will see a sign to take you there. Ask anyone who lives in Malta where the most chilled swimming spot on the island is and they will no doubt tell you that it’s Exiles. Situated on a headland guarding the Balluta beach (you can swim there too and it’s just a stone’s throw away) you can sip beers at a beachside bar while enjoying tunes from the jukebox. Getting there is easy; drive to Sliema, park at the Dingli Circus GoTo spot and make a beeline to the water. You can’t miss it, but if you do, just ask a local! Gozo has some amazing beaches and swimming spots that you just can’t ignore. By now, you know how to get the ferry point in Cirkewwa, but for Gozo, we definitely recommend using the GoTo car’s map. Head to Xlendi, west of Victoria for lunch, a walk round the cliffs and a jump in the water. Ramla l-Hamra is found on the eastern side of the island and is stunning. Although it’s sandy, watch your feet on the rocks when you enter the water. Marsalforn, also east of Victoria, is another popular beach with the locals. All of these locations have free GoTo parking. Just pick up a car sharing car from the street and head off to the beach. Just pick up another car to get back and you’re good to go! Happy exploring Malta’s and Gozo’s beaches with GoTo.